KMC is the biggest municipality in terms of economic size in the country. 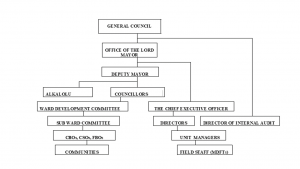 The council is better administrative structured than any other council. For the effective operation of council’s day to day running, a Chief Executive Officer is recruited. He is the Chief Accounting Officer of Council. Under the CEO are a team of Directors (Administration, Finance, Planning and Development, Internal Audit, Inspectorate and Social Services) as per the provisions of the Local Government Act 2002 and the Finance and Audit Act 2004. Under each of the Departments are Managers who head units. The Managers are supported by a team of field staff who are the main community interface. Establishment of Local Roads Authority for the upkeep and maintenance of secondary roads in accordance with the Roads and Highway Act. The establishment, registration, removal of members and dissolution of Village and Ward Development and Technical Advisory Committees.